Monophonic synthesizer with all sound engine parameters controlled via three independent sequencers. Oscillator: tracks for gate, waveform (saw, square, FM sine, waveshaped sine), pitch and pitch modulation envelope. Filter: tracks for filter type (low-pass, high-pass, band-pass, band-reject), frequency and frequency modulation envelope. Effect: tracks for effect type (frequency shifter, phaser, flanger, decimator), parameter and parameter modulation envelope. Each sequencer has its own step count, duration, timing, swing, and lag settings. 12 separate parameter snapshots in a single preset, switchable via MIDI keyboard or host automation. 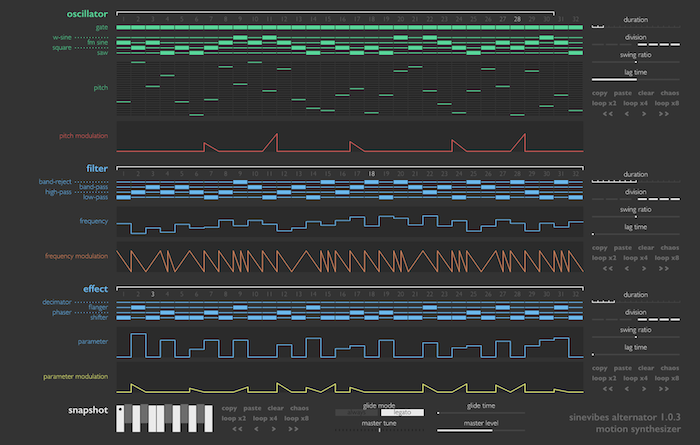 Fluid sequencer graphics that visually reflect timing and swing settings. Support for multi-touch gestures and force touch on compatible trackpad devices. Works with any application that supports Audio Unit instrument plugins. – New multi-color scheme for modulation envelopes (red, orange and yellow). – Multiple design enhancements for control elements and function buttons. – Increased maximum sequence duration from 8 to 16 bars. – Re-calibrated feedback and low cut filter in flanger.